In his Paris studio Thomas Hirschhorn is putting the finishing touches to a model hotel. But its not like any place youd want to stay in. Propped up on an uneven foundation of pallets and trestles, the two-storey structure exudes a rather clumsy shabby chic, fusing the look and feel of a home-made dolls house and the poster-plastered walls of a teenagers bedroom with the spatial sensibilities of a battery chicken farmer. You might argue that the model emphasises content rather than form, but while the rooms are filled with furniture and the walls papered with images, the end result is an awkward and unsettling mix of styles and scales. Some of the beds appear to be carefully crafted miniatures; others are blocky objects made from cardboard and masking tape. (Not to mention one rather indescribably shaped armchairtype object.) Thomas Hirschhorn is the ultimate cowboy builder. Over the past decade and a half the 46-year-old Swiss-born artist has created a series of structures  among them kiosks, altars, huts, assorted monuments and even a launderette  out of seemingly amateurish accumulations of cardboard, plywood, plastics and tinfoil. Most of them are held together by a paranoid, almost frenzied, application of masking tape (rolls and rolls of it). But ironically this serves more to emphasise the works fragility than to provide it with any structural strength. I am not interested in quality, says Hirschhorn. I am interested in energy. And while you wouldnt want him supervising your loft conversion, his cheaplooking ramshackle constructions have made him one of the art worlds rising stars. According to Hirschhorn, art exists as the absolute opposite of its time  as the absolute opposite of the reality of its time. And through his own work he seeks to show that there is more to this opposition than the fact that the context of art makes it possible to celebrate the kind of shoddy building that people living in the real world would not tolerate at all. World Airport, created for the 1999 Venice Biennale, is one of Hirschhorns biggest and best known artworks. And it draws together many of his central concerns. At its heart is a world map, redrawn as a rank of crudely made model aircraft, each branded with the colours of a different national airline. Around it all is a somewhat bewildering network of texts, images and handmade objects, incorporating representations of commercial brands that dominate the world economy  a giant Nike trainer and ranks of anonymous Ford motorcars  alongside tributes to socialist martyrs and campaigners for workers rights  such as Rosa Luxemburg and Antonio Gramsci. As a whole it is overwhelming and rather difficult to take in, but perhaps that provides a more accurate snapshot of the world and its troubles than the more simplified daily image of cheap flights, instant global connectedness and a never-ending supply of factory-made consumer goods ever could. Somehow Hirschhorns comic constructions have a habit of appearing more real than reality ever does. Perhaps indeed he is telling us that in the real world we tolerate too much. Irritatingly though, it only takes one more look at his crappy construction style to make you wonder if that might be interpreting too much. The model in his studio is called Hotel Democracy, one of two new works that will be shown in Common Wealth at Tate Modern. 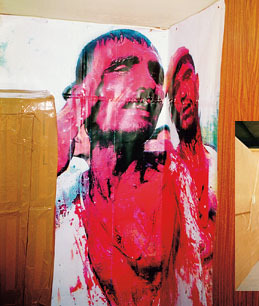 Its rooms are lined with media images relating to struggles for democracy around the world. And it is in such struggles that Hirschhorn finds a parallel for his art. At one point during TATEs studio visit his reflection in one of the hotel room mirrors stands in for the fighters and protesters that fill the rest of the walls. Freedom is what I am fighting for, he says, and I think you only get freedom when you are fighting for it. The artist is a fighter for absolute freedom. The decision to be an artist is absolute and for eternity, he continues. That has nothing to do with romanticism or idealism. It is a question of courage. I want to be courageous. An artist has to be courageous. Because he or she fights for the impossible, he or she has an impossible mission. It is impossible because there is no exit. No exit out of the world. The emergency exits in Hotel Democracy utterly shatter the illusion that it might represent anything real. They are nothing more than crudely drawn outlines on the building walls. TRABALHAR COMO ZOMBIES - França 2005. «Não há nada aqui. Absolutamente nada. Vivemos quatro numa divisão, os nossos pais trabalham todos os dias como zombies, mas nós não temos nada. Os empregos que há vão para gente vinda de outras cidades. O parque de estacionamento é o nosso salão, o único sítio para onde podemos ir» Abdelkarim, citado no JN de 7 de Novembro de 2005. «O que queimam esta noite?» troca de sms's entre jovens dos subúrbios de Paris. «Não há maneira de lhes chamar a atenção. A única forma de comunicar com eles é incendiando», miúdo da Costa do Marfim (francês?). «Isto é uma desgraça, mas compreendo os miúdos. Tratam-nos como se fôssemos menos do que nada, ninguém pensa em nós». Comerciante de Evreux. 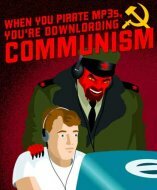 Um cartaz excelente sobre a autogestão e anti-propriedade da música na Net. De uma universidade basca.